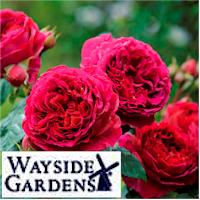 10% off Any Order at Wayside Gardens. Use coupon code WGTAKE10 during checkout. Growing roses is not difficult, but there are basics which, if followed, will cover the majority of issues involved in growing roses. It's important to get roses that are hardy in your zone and to provide full sun. That means more than 6 hours of direct sun daily, not filtered shade. Good hygiene is crucial to prevent diseases and keep on top of pests. Fertilizing, watering and grooming will keep your roses blooming strong. A rose fertilization program involves applying a quality rose fertilizer in spring and throughout the growing season. Roses are heavy feeders; they take lots of nutrients from the soil. On top of that, many nutrients leach from the soil very quickly. So the trick is to feed roses often and lightly. But, stop feeding 6 to 8 weeks before the expected first frost in autumn. What and When to Feed? Feed roses often and lightly. The big 3 nutrients are: Nitrogen which promotes healthy green growth; Phosphorous, which is vital to strong root growth and flower production; and Potassium, which is needed for vigorous growth. For Miniatures: First application in early April using 1 tablespoon of 10-20-20 or 10-20-10 scattered around each plant and scratched in lightly. For the second application in early June use a soluble 20-20-20 fertilizer such as Rapid-Gro, mixed according to the directions on the package; use 1 cup of this solution around the base of each plant. The third application early in July is the same as the second. Alternatively, you can use 1/2 the amounts divided over 6 feedings. Old Garden Roses and Shrub Roses: Most of these don't need much fertilizer. Once in the early spring with a general all purpose 20-20-20 will hold them for the year. For repeat blooming types, a second feeding can be applied after the spring flush of bloom is done. The secondary macronutrients are sulphur, calcium and magnesium. Use of a high quality rose fertilizer will ensure that these macronutrients are made available to the roses. Of these secondary macronutrients, magnesium is of substantial interest to the rose gardener. Magnesium sulfate, provided in the form of Epsom salts, is a time-honored secret for intensifying flower color, increasing flower production, and flushing harmful salts through the soil. Add epsom salts at the rate of 1/2 cup per plant per month. The seven micronutrients are iron, manganese, zinc, copper, molybdenum, chloride, and boron. Ensuring that your soil is of the proper pH for your roses will ensure that plants can access micronutrients in the soil. Especially in areas where soil is alkaline, you may need to correct the pH and/or foliar feed with a fertilizer that contains chelated micronutrients. Both macro and micronutrients are plentiful in compost and composted manures and leaf mold. Topdressing annually with a good layer of compost should be sufficient for most established roses. American Rose Society's "alfalfa tea" for roses! Alfalfa tea is a great fall potion that doesn't interfere with normal fall processes. Alfalfa tea releases a growth hormone that makes everything work better. add water, stir and steep for four or five days, stirring occasionally. You may also "fortify" with 2 cups of Epsom salts, 1/2 cup of Sequestrene® (chelated iron, now called Sprint 330) or your favorite trace element elixir. The tea will start to smell in about three days. Keep the lid ON. Use about a gallon of mix on large rose bushes, 1/3 that much on mini's. And keep the water going. When you get to the bottom of the barrel, add water to fill it up again! One load of meal or pellets will brew up two barrels full, but add more fortifiers for the second barrel. You'll see greener growth and stronger stems within a week. Water roses less often and deeply. The key to watering roses is to water deeply, with the goal of providing roses with one inch of water per week (a rain gauge is very helpful in knowing how much extra watering to supply to augment rainfall). If you have properly prepared your rose beds with additions of copious amounts of organic material, and inch a week is all you will need. Roses are deep-rooted plants, and the goal is to encourage the development of roots which grow as deeply as possible into the soil. If one makes the mistake of frequent, light watering, the result will be a plant with shallow roots, ill-prepared to handle the drying of the upper layer of soil during droughts. Note: monitor newly-planted roses carefully, as they will not have yet developed deep roots during the first growing season. Water from below or in the morning. Damp, cool conditions are a breeding ground for the diseases which trouble roses. Your goal is to ensure that rose leaves are dry by dusk. You can either water in the morning, or water the soil around the plants using a drip irrigation system. Grooming is a regular feature of rose culture. Removing faded flowers after each flush of bloom improves plant appearance and prevents fruit development. Flower buds should be removed for the first two months after planting to encourage growth and help to establish a new plant. The first flowers allowed to develop should be cut with short stems to leave as much foliage as possible on a new plant. At any time, remove dead wood and canes showing disease symptoms. Cut the affected part back to healthy wood and remove it from the garden. Additional pruning should be done each year in early spring just as the growth buds start to swell. Vigorous shrubs may need pruning twice a year for size control. To avoid dieback and encourage rapid healing, pruning cuts should be made just above a dormant bud. For details and examples on pruning, see the Pruning Techniques article. Although old garden roses and some shrubs roses defy even the frigid winters in the far North, most modern bush roses are too tender to tolerate winter's worst. In zone 5 or colder, you should protect rosebushes from winter cold See Winterizing Roses for various methods of rose protection. If you live in places where there isn't snow in winter, prune your rose about 4 to 2 weeks before the last frost date (check the map). Shorten healthy canes to 8 to 24 inches tall and cut out weak or damaged canes, keep only the 3 or 5 thickest and darkest green ones- these are the most vigorous ones. Make cuts with clean, sharp handheld shears, cutting at a 45 degree angle just above outward-facing buds. Keep in mind that every time you cut off a fresh or faded flower you actually prune the bush and influence its growth. You must remove the faded blossoms properly to stimulate new growth and thus more flowers. When cutting a flower use sharp handheld shears and cut at a 45 degree angle just above the first large leaf with 5 leaflets (not too close, not too far, about 1/4 of an inch). New growth emerges from the axil of this leaf and produces more blossoms. Hybrid Tea Roses and Glandifloras are pruned in this way. Cut back canes to within 6 inches of ground every 3 years to renew vigor. Cut out dead canes and prune weak canes to 6 inches every year. In cold areas, remove oldest and weakest canes at bases while dormant, leaving a total of 5 to 8 of the newest, strongest canes. Cut side branches back to 3 buds. Partially dig up roots, tilt plant, and lay canes on ground, burying with soil to overwinter (See Winterizing Roses). In warm areas, just let it grow until it reaches the size that you want. Then, every year, when it's time to prune, cut the excess if it grew too much. Cut out the bad canes and prune one of the oldest canes to 8 inches tall, prune one of the oldest canes per year this way. A schedule of rose maintenance includes spraying and irrigation each week, grooming and fertilization after each flush or growth, pruning and mulching during each winter season. This caring for the health of the rose plant can provide an abundance of bloom that extends through the growing seasons for many years. If you grow hybrid teas, you must resign yourself to an additional never-ending regimen of spraying for fungus problems and insect pests. However, any rose can be affected with powdery mildew or black spot fungus diseases in particularly humid seasons. Various beetles also have a craving for rosebuds, but the key to this is to prevent them by treating your lawn and flowerbeds for beetle grubs. The trick is to kill them before they grow...See the Plant Problems pages for more details. At the first sign of fungus problems, or before any signs appear in areas where you know you have a problem, start spraying every 7-10 days, and after rains, with a mixture of a few drops of dishwashing liquid and a tablespoon of baking soda to a quart of water. If that doesn't nip it in the bud, so to speak, try a mix of 1/10 strength skim milk. It must be skim milk to work - anything else will go rancid and attract more problems to your garden. If that doesn't do it, then it's off to the garden center for systemic fungicides. See the Plant Problems pages for more details. The dishwashing liquid treatment also works for most small insects. If you do get a horde of rampaging beetles or other voracious types, check the Plant Problems article for information on insecticides and other insect controls.